Home of famous Va. hams ponders foreign buyout! You can't go far in this historic southeastern Virginia town without seeing a pig. The home of the world's largest pork producer and maker of famous Smithfield hams is divided in its reaction to news that the company agreed to be bought by a Chinese company. The reception is as mixed as whether the locals favor salt-cured or sugar-cured ham. Smithfield Foods Inc. agreed to a $4.72 billion offer from Shuanghui International Holdings Ltd., the majority shareholder in China's largest meat processor. 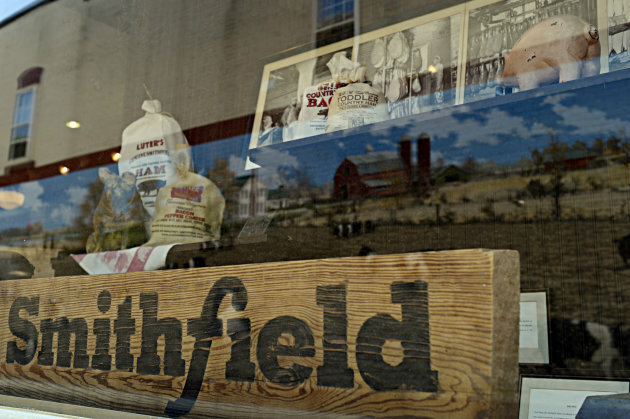 still faces a federal regulatory review and Smithfield shareholder approval.